A brand new colouring book bursting with some of the most beloved scenes and characters from the bestselling and iconic Asterix series. 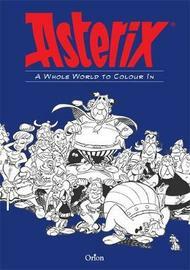 Featuring battles, banquets and of course, Romans, bring the world of Asterix to life with 112 pages of exquisite original line art, ready to colour. This is the perfect gift for Asterix fans old and new!